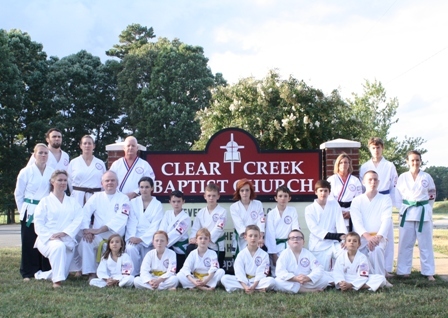 The Karate Ministry at Clear Creek Baptist Church is a faith based Martial Arts Instruction. We teach concepts to becoming a good citizen through a strict, organized, and structured class promoting discipline and respect. This class teaches the Bushido Code of the Samurai (Morality, Courage, Benevolence, Respect, Honesty, Honor, and Loyalty), Training Hall Maxims (Character, Sincerity, Effort, Etiquette, and Self Control), the Four Principles of Kidokime-ryu Karate-do (God, Soke/Sensei, School, and Organization), along with other important concepts. Each class starts off with the pledge of allegiance to the American Flag and the Lord’s Prayer. During class you will learn how to develop yourself spiritually, mentally, and physically through Martial Arts training, discipline, and respect. Each class also ends in prayer. Each member of class is always encouraged to attend church and give thanks and praise to Christ. Members are also encouraged to support their church. And if they don’t have a church to attend, you are always invited and encouraged to attend Clear Creek Baptist Church. Our Class motto is, “We Set the Example by Exceeding the Standards”, and our class Bible verse that guides us is, “I can do ALL things through CHRIST who strengthens me”. Classes are held on Tuesday and Thursday nights from 5:30 - 8:30 pm. We also have some additional or special meetings throughout the year. 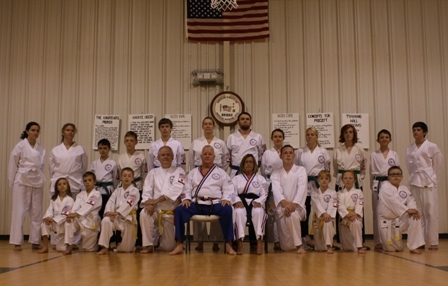 We give demonstrations, attend seminars, and tournaments. We welcome all newcomers. Our class location is 9015 Ferguson Rd, Charlotte, NC, in the Family Life Center (FLC) of Clear Creek Baptist Church. 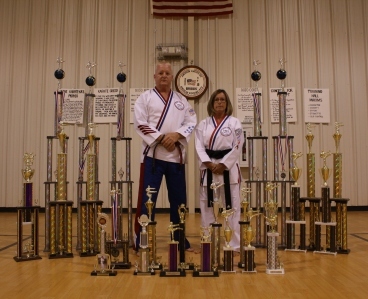 Our Soke is Bobby Briggs (9th deg Black Belt, Grandmaster), Sensei Mary Beth Briggs (1st deg Black Belt), and two Assist Instructors Ms Dana Carr & Mr Chris McEwen (both Brown Belts). Classes are free. Each member is encouraged to donate $1 per class, per person to help with the end of year banquet that is put on each December.